The Supreme Lord has three different internal saktis (potencies), Shri, Bhu and Nita. Bhu sakti appeared as Shrimati Vishnupriya Devi in Gaura lila to assist Shri Caitanya's sankirtana movement. King Satrajit, the father of Satyabhama in Krishna lila, appeared in Gauranga lila as the brahmana Sanatana Mishra, Vishnupriya Devi's father. Shrimati Vishnupriya Devi overflowed with all good qualities. Her beauty surpassed the goddess of fortune. She was devoted to her parents and dutifully followed scriptural injunctions. Regularly she worshiped Tulasi Devi, and observed vows of austerity such as bathing thrice daily in the Ganges. Whenever she met Saci Mata at the Ganges Vishnupriya would humbly bow down at her feet. Saci Devi often thought that chaste beautiful Vishnupriya would make an ideal bride for her son Nimai. After Laxmipriya Devi, Lord Caitanya's first wife, "died in separation from the Lord," Nimai Pandit married Shrimati Vishnupriya Devi. Caitanya Mangala and Caitanya Bhagavata give elaborate descriptions of this most auspicious wedding. Buddhimanta Khan, a rich landowner, bore all expenses of the opulent royal wedding of the Divine Couple, Vishnupriya and Shri Nimai Pandit. All the people of Navadvipa and the neighboring villages came to the wedding. During the ceremony all eyes were on the Divine Couple,as if to devour the matchless beauty of Vishnupriya and Nimai Pandit. The Vaisnavas sang Hari's glories. The brahmanas made a circle around the Lord and chanted the Vedas. A sea of joy flooded the four directions. Those who didn't drown simply floated in bliss. Besides the wedding, Vrindavana Dasa Thakura doesn't elaborate about Vishnupriya's pastimes. "Then Shri Gaurasundara showed His four-armed form which helped Vishnupriya understand His absolute position. Seeing this vanquished Vishnupriya's grief and pain. She felt blissful. This vision and Mahaprabhu's instructions removed her bewilderment. But she kept the mentality of taking the Lord as her husband. After Shri Nimai Pandit left Navadvipa, Vishnupriya adopted an austere and devoted life. She became as thin as the crescent moon before Amavasya (dark moon). Following a rigid sadhana (spiritual practice), she set aside one grain of rice for every round of Hare Krishna japa she chanted. In the evening, Vishnupriya Devi cooked these grains, offered them to her personal Deity of Mahaprabhu, and honored the remnants. Known today as Dhamesvara Mahaprabhu, Vishnupriya's gorgeous Deity of Shri Gauranga Mahaprabhu resides in Navadvipa city. Shriman Mahaprabhu receives regular worship and gives unlimited mercy. Basant Panchami or Saraswati Puja marks the appearance day of Shri Raghunath Das Goswami, Shri Pundarik Vidyanidhi and Shri Vishnupriya Devi, the consort of Shri Chaitanya Mahaprabhu. All manifestations of Vishnu tattva have three shaktis, known as Shri, Bhu and Nila (or Lila). Lakshmipriya Devi is the sri-shakti of Mahaprabhu in his majestic Gaura-Narayan form; Vishnupriya is the manifestation of His bhu-shakti and Nabadwip Dham is His lila-shakti. Shrila Gadadhara Pandit represents the shakti of Gaura-Krishna or Mahaprabhu in the mood of Krishna. After the untimely demise of her daughter-in-law Shri Lakshmipriya Devi, Sachi Mata started looking for another wife for her young son then around 17 or 18, and consulted Kashinatha Pandit for that purpose. Kashinatha was a well-known matchmaker who is described in Gaura-ganoddesa-dipika as having been the Brahmin in Krishna lila named Kulaka who was sent by Maharaj Satrajit to arrange the marriage between his daughter Satyabhama and Krishna. So some regard Vishnupriya ji is the expansion of Shri Satyabhama devi. Kashinath pandit then went to the home of Pandit Sanatan Mishra to arrange the marriage between Nimai and his daughter, the devotionally minded Vishnupriya. From her early childhood, Vishnupriya Devi was devoted to her parents and to Lord Vishnu, taking her bath in the Ganges three times daily. She regularly saw mother Sachi there, paid obeisance to her and received her blessings. In this way, Sachi already knew Vishnupriya's good qualities, and was happy to agree to accept her as a wife for her son. Once it was decided that Vishnupriya and Vishvambhara would be married, an auspicious day and time were fixed for the ceremony. With great pomp, the adhivaasa rituals were carried out on the eve of the marriage. The Lord arrived at Sanatan Mishra's house in a palanquin at dusk and Gaurasundar and Vishnupriya's wedding ceremony was performed according to both scriptural and popular traditions. On the following day, Vishnupriya joined her new husband on the palanquin and returned with Him to His house. On the threshold of her married home, Vishnupriya accidentally hurt her foot on the doorway. Her toe was injured and she bit down on her lip to tolerate the sharp pain. In her heart, fearing that this may be a bad omen, she trembled with fear and almost fainted. Just then Mahaprabhu who was standing beside her, pressed His own toe on her injured toe and gazed intently into her eyes. Upon the divine touch of the Lord's lotus feet Vishnupriya devi at once steadied herself and entered the house. If one hears the eternal pastime of the wedding of Shri Lakshmi and Narayan, they gradually lose their desire for the material relationship of enjoyer and enjoyed, for one comes to understand that Shri Hari alone is the Supreme Enjoyer of the entire universe. It was after his marriage to Vishnupriya that Mahaprabhu went to Gaya and met Shri Ishwar Puri and received initiation from him. When He returned to Navadvipa, He was a changed man. He cried out for Krishna and wept. Both mother Sachi and Vishnupriya anxiously witnessed Mahaprabhu's increasing intensity and self-forgetful absorption in ecstatic bhakti. As time passed, the rumours that Nimai Pandit might take sanyas reached their ears. Mother Sachi felt that her life would end. She fell unconscious to the ground when she first heard the rumour. Later with great trepidation, when she broached the subject with her son, her worst fears were confirmed. She cried, pleaded and reasoned with Nimai. "After the death of your father and your elder brother's sanyas, I have survived only by looking at your face. If you also leave me now, I will certainly die." she wept. As mother Sachi implored Him in many ways, Nimai listened quietly, with His head bowed. Realising that his mother would not survive, He took her aside and revealed to her His real identity and hers too. He told her that long ago in ancient times, her name had been Aditi and He had incarnated as her son Vaman. Then when she was known as Devahuti, He came as her son Kapila. As Kaushalya, He was born of her as Ramachandra, and again He was born as her son Krishna when she was Devaki in the Dwapara yuga. Mahaprabhu then told His mother that He had disclosed the most confidential secret to her was so that she could fulfil her role in His great mission. In My form as the deity, you are My mother as the earth. In My form as the holy names, you are My mother as the tongue. In this way, birth after birth, you have always been My mother. We are really never separated, he told her. Nevertheless, mother Sachi was plunged in a sea of sorrow. Vishnupriya Devi was 8 or 9 at the time of her marriage. As was the custom, she remained in her parents' home until she came of age and possibly came to her husband's house at around 12 or 13. Her separation from Lord Gaurhari took place hardly a year later, when she was 14 and Mahaprabhu 24. Although Visnupriya devi was his wife, Mahaprabhu hardly ever spoke with her, especially when He returned from Gaya where He took harinama and diksa initiation from Shri Isvarapuri. His personality underwent a sea change at that time. He was no longer known as Nimai Pandita. Now He became known as Bhavuka Nimai, Nimai who is always absorbed in His ecstatic moods of Krishna prema. At this time, however, some of the inhabitants of Navadvipa, especially the students and His former teachers in the schools were somewhat unfavorable towards Him. Mahaprabhu thought, "I came to give the supreme medicine for everyone's material disease, but these persons do not listen to Me. I should take sannyasa, for then they will respect Me.” This is one of the reasons why Chaitanya Mahaprabhu took sanyasa. On the day He decided to take sannyasa, Visnupriya devi went to bathe in the Ganges. While She was on the way there, she accidentally stubbed her toe on a stone, and it was injured and started bleeding. Then, while she was in the midst of bathing there, the nose-ring she had received on her marriage day and which is very auspicious for a wife, fell in the Ganges. Although she searched for it with great endeavor, She could not find it. She began to weep bitterly, "Why are all these things happening today?" Later, when She returned home, Sachi Mata asked her, "O my daughter, why you are weeping so?" She replied, "Today I went to bathe in the Ganges. My foot was injured, and I lost my nose-ring. I don’t know what is to be my fate." Sachi Ma tried to console her. Although Chaitanya Mahaprabhu had previously paid practically no attention to her, that night, after taking some prasadam, He decorated her hair and placed betel nuts in her mouth. That morning He had gone to visit and meet with all His associates. He had procured some milk, He had also gotten a loki vegetable from Shridhara, with whom He would always jokingly quarrel. When he returned home in the evening He told Saci Ma, "Mother, please make a preparation from these, adding sugar, ghee, camphor and other ingredients, and offer it to Krsna." He later honoured that prasada, after which He entered the room of Vishnupriya devi. Then, with love and affection He decorated her, gave her a beautiful garland, placed betel nuts in her mouth and engaged in loving conversation with her. Vishnupriya was greatly perplexed "What is this? A hurricane light burns brightly when it is just about to be extinguished. I see now that my fate may be like this. Thinking like this, she gently sat and massaged His lotus feet, tears pouring from her eyes. Shri Gauranga opened his eyes when He felt her tears on His feet. Pulling her to Him and gently wiping her tears, He asked, O Goddess. You are most dear to Me. Why are you weeping? Unable to utter a word Vishnupriya wept uncontrollably. A flood of tears rained from her eyes. Shri Gauranga asked her again and again, but she wouldn't say a word. Holding His feet with both her arms, she wept. Then, the Lord who is the In-dweller in everyone's heart, gently placed her on His lap and spoke sweet words to her and calmed her down. In a voice choked with emotion, Vishnupriya finally spoke, My life, my beauty, youth, my service, my dress and adornment is only meant to please You. If You leave me, what will I, a worthless pile of ashes, do with my life? she cried. The most munificent and merciful Lord was neither unaware nor indifferent to His dearest devotees' pain and grief. He also wept with her. Finally, to her also, He revealed the secret of His birth and mission. Wiping her tears with his garment, He embraced her and told her that Lord Shri Krishna is the supreme Husband of all. "Your name is Vishnupriya, she who is dear to Lord Vishnu. Please make your name true to yourself. Please do not needlessly torment yourself with worries of the world or what they will say. Dedicate your mind and body to serving Shri Hari." Lord Gauranga then manifested His four-armed Narayan form. He displayed His maya shakti and made Vishnupriya temporarily forget her pain. He joked and teased her and satisfied her. Thus they spent their last night together. Mahaprabhu then gave her His special kripa, "O Goddess Vishnupriya, now hear my words. Whenever you think of Me, I will come to you. I solemnly promise you this. It is the truth." Then Yogamaya entered Vishnupriya's eyes in the form of sleepiness. She did not want to fall asleep, but by the power of Yogamaya she was forced to do so. Caitanya Mahaprabhu glanced at her once, and then stood up to leave home and take sannyasa. Just before dawn, rising from his bed where Vishnupriya lay, Lord Gauranga finished his morning rituals. Touching the feet of mother Sachi who sat like a statue at the doorway, eyes wide open but unable to move, the Lord left Navadvipa and crossed the Ganga. Vishnupriya lived her life in the slow burning agony of separation from Shri Gauranga after His departure. Every morning, with the exception of taking bath daily in the Ganga alongwith mother Sachi, she always remained in the house. She led a very strict spiritual life and would look after Sachi Devi who was heart-broken and devastated after her son's departure. Not even the devotees could see anything more than her feet, nor would anyone ever hear her voice. Constantly shedding tears and eating only Mother Sachi's remnants, she became pale and thin. She immersed herself in the Holy Name, chanting all day long in solitude before a portrait of Gauranga, serving it as though He were present in it and surrendering herself to His lotus feet. For every 16-syllable Naam she uttered during her japa, she would place a grain of rice aside. When she had completed her rounds, in the early afternoon, she would cook whatever rice was collected in this manner, offer it to the Lord, serve Sachi Mata and eat only the remnants thereafter. Shri Vamsivadana Thakur and Ishan Thakur were blessed by the service of taking care of Vishnupriya Devi and Sachi Devi after Mahaprabhu took sanyas. It is said that Vishnupriya Devi abandoned food and drink until He appeared to her in a dream, telling her to have a deity of Himself carved from the wood of the margosa tree under which Sachi mata had sat to suckle Him. When the deity was finished, Vishnupriya sang the verse of Chandi Das: Here is the Lord of my life. I am finally able to see Him for whom the arrows of desire have caused me to burn and come to the point of dying. 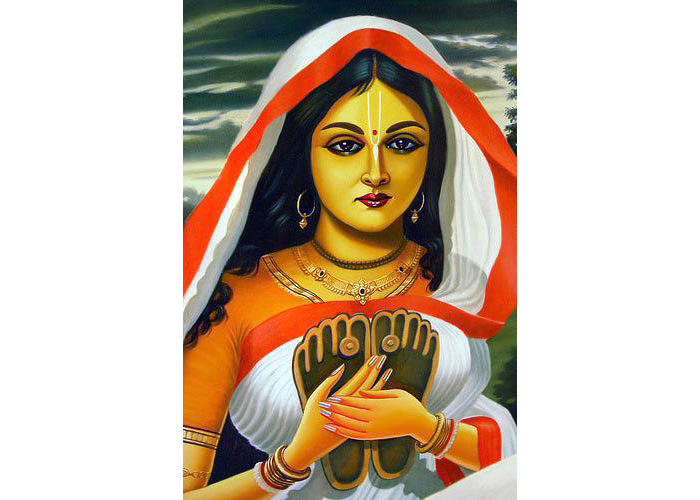 She was thus the first to establish worship of a deity of Gauranga Mahaprabhu. 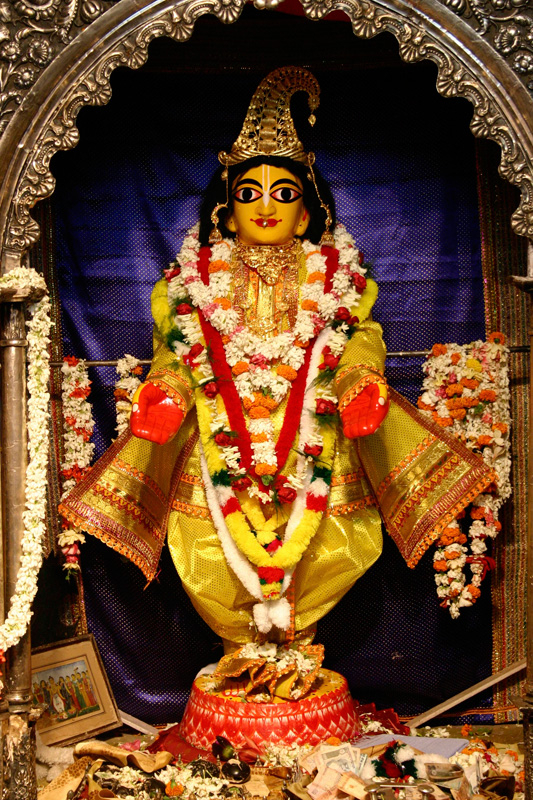 Just as Bhagawan Ramachandra, who had taken the vow of monogamy, had a golden statue of Sita devi made after Her exile to the forest, rather than marry a second time, so Vishnupriya repaid her debt to her Lord in the pastimes of Gaura-Narayan by having an image of Mahaprabhu created so she could perform the sacrifice of the Holy Name to Him. The image of the deity she installed and worshipped is given here. This deity is still worshipped to this day in Navadvipa. Shrila Bhaktivinoda Thakura relates the following pastime in his Shri Navadvipa-Dhama-Mahatmya: During his exile in the forest for 14 years, Lord Rama visited Ramkeli, Gangasagar and Navadvip areas of Gaud desa. Once as Lord Rama was observing the extraordinary beauty of the forest, He began to smile. Sita asked Him why He was smiling, and Shri Rama replied, "In this forthcoming Kali-yuga, I will take birth from the womb of Mother Sachi in Shri Jagannatha Mishra's house in this same Navadvipa-dhama. People will know Me as Gauranga, and I will charm everyone by performing a variety of enchanting pastimes. I will manifest the glory of the Holy Name and thus madden the common people with the chanting of these names. I will change the hearts of even hardened sinners and give them love of God, which even the demigods rarely attain. In My youth I will accept sanyas, after which I will reside in Shri Jagannatha Puri. At that time My mother Sachi-devi, who is none other than Kausalya, will weep holding her daughter-in-law Visnupriya in her arms. You will be that Visnupriya. I will thereafter remain in Puri and will also weep for you day and night. By her devotion and austerity, Shri Visnupriya Devi, played a very important role in the preaching of Gaudiya Vaishnavism. Through her acceptance of the mood of separation, her surrender to her Lord's mission, her showing of the pangs of separation, she helped in establishing the ideal of union in separation, the cornerstone of Gaudiya Vaishnava philosophy. She melted the hearts of many and did away with the envy or antagonistic feeling toward Mahaprabhu that many people harboured at the time. And thereby in Bengal she facilitated the preaching of Nityananda Prabhu and the glorification of Shri Chaitanya Mahaprabhu.